A scintillating double-century stand between New Zealand openers Jakob Bhula and Rachin Ravindra lit up the Hagley Oval as several records were broken during the Group A match against Kenya which the hosts won by a huge margin of 243 runs in Christchurch. Bhula’s astounding innings of 180 was the highest individual innings in the history of U19 ODIs, while his 245 runs first wicket partnership with Ravindra (117) was the best-ever opening stand in U19 CWCs. The opening wicket partnership set the tone for more onslaught as Finn Allen joined the party with a belligerent 90 that resulted in New Zealand notching a mammoth 436 for four, the second highest total in ICC U19 Cricket World Cup. In another Group A match in front of broadcast cameras, Wandile Makwetu scored a run-a-ball 99 not out and fast bowler Hermann Rolfes took four wickets to help 2014 champions South Africa defeat defending champion the Windies by 76 runs. The result means New Zealand and South Africa have progressed to the Super League after two successive wins, while the Windies and Kenya, following back-to-back defeats, will now feature in the Plate Championship. Elsewhere, Afghanistan defeated Sri Lanka by 32 runs to become the first side to qualify for the Super League from Group D. This result means the winner of Sri Lanka and Pakistan match on Friday, 19 January in Whangarei will become the second side to progress to the Super League from Group D.
In the fourth and last match of the day, Australia coasted to a comfortable seven wickets victory over Zimbabwe to notch up their first win in Pool B. On Friday, 19 January, Australia will take on Papua New Guinea and India will meet Zimbabwe, and if both Australia and India win their matches, they will qualify for the Super League. New Zealand openers Bhula and left-hander Ravindra made Kenya captain Sachin Bhudia repent his decision to field first as the pair added 245 runs in less than 36 overs, providing Allen the launching pad as the home side finished at 436 for four in their 50 overs. Bhula smashed 10 fours and five sixes off 144 deliveries. He was in sight of the maiden double-century in U19 cricket, but was run-out with three overs remaining. Nevertheless, his innings bettered the previous highest individual score of 179 not out by Australia’s Theo Doropoulos against England in 2003. The previous highest in U19 CWCs was 176 was in the name of Donovan Pagon, which the Windies batsman had scored against Scotland in 2002. Ravindra matched Bhula stroke-by-stroke as he clubbed eight fours and three sixes in an entertaining 101-ball 117. Their partnership was the second best for any wicket in the ICC U19 Cricket World Cup. Later, Allen’s 40-ball 90 (8x4, 6x6) further inflated the total, which is second only to Australia’s record score of 480 for six, which also came against Kenya in 2002. Kenya never went for the target and played out the 50 overs to finish with 193 for four. Opener Aman Gandhi scored 63 off 106 deliveries while Thomas Ochieng made an unbeaten 39 off 47. Ravindra followed up his century with two for 33 bowling his left-arm spin. Afghanistan qualified for the Super League with a 32-run victory over Sri Lanka in a rain-reduced match Group D match in Whangarei. Put in to bat, Afghanistan posted a formidable total of 284 for seven with Ibrahim Zadran (86, 112b, 1x4, 5x6) the top-scorer and Darwish Rasool (63) and Ikram Ali (55) coming good for a second time in the tournament following useful contributions in the five-wicket win over Pakistan on the opening day. Sri Lanka, whose target was revised to 235 from 38 overs under the Duckworth-Lewis-Stern method following a rain interruption, were bowled out for 202 in 37.3 overs. Afghanistan captain and new-ball bowler Naveen-ul-Haq followed his three-wicket haul against Pakistan with figures of four for 35 while Azmatullah Omarzai and Qais Ahmed finished with identical figures of two for 37. Jehan Daniel (48), Krishan Arachige (41), Ashen Bandara (38) and captain Kamindu Mendis (32) all got good starts but Sri Lanka missed the one big knock that could take them through. Wicketkeeper-batsman Wandile Makwetu missed a well-deserved century by one run as South Africa recovered from 112 for five to 282 for eight. Makwetu clubbed 12 fours and a six in a 99-ball 99 not out. Makwetu added 58 runs for the sixth wicket with Kenan Smith (22), and 67 runs for the eighth wicket with Gerald Coetzee (29) after South Africa were provided a solid 56-run start by openers Jiveshan Pillay (47) and Matthew Breetzke (18). In their run-chase, the Windies slipped from 177 for four in the 38th over to be bowled out for 206 in 45.3 overs. Alick Athanage (76, 100b, 6x4, 1x6) and Kirstan Kallicharan (44) were the star Windies batsmen as they put on 90 runs for the fifth wicket. Hermann Rolfes was the standout South Africa bowler when he recorded figures of 10-3-33-4, while Gerald Coetzee and Jade de Klerk picked up two wickets apiece. Makwetu had an overall good day when he also accounted for three batsmen behind the wickets. 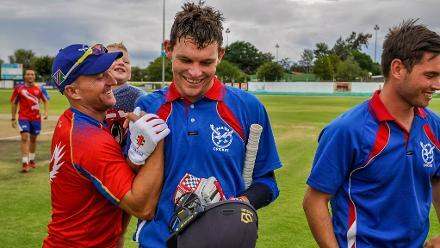 South Africa captain Raynard van Tonder was happy to have won. Australia completed a comfortable seven-wicket win over Zimbabwe after having lost their opening match to India by 100 runs. Zimbabwe, who had beaten Papua New Guinea by 10 wickets in their first match, were bowled out for 134 in 33.2 overs by the three-time champions with pace bowler Xavier Bartlett accounting for the top three batsmen and reducing Zimbabwe to 35 for three by the 19th over. All-rounder Will Sutherland and spinner Lloyd Pope followed up with two wickets each, conceding 21 and 31 runs, respectively. Australia achieved the target in only 18.2 overs with openers Max Bryant (44) and Jack Edwards (40) producing quick knocks and captain Jason Sangha (30) taking the team closer to the target. According to the event format, the top two sides from each group will advance to the Super League while the remaining eight teams will figure in the Plate Championship. The preliminary round matches will be followed by quarter-finals, semi-finals and finals, plus the play-offs.